started business in the early Edo period at the foot of Kiyomizu temple where our shop stands today. 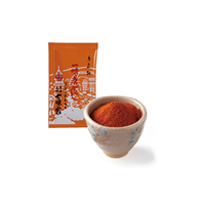 In those early days, our ancestors would offer hot water drinks with floating chilli powder to the visitors of the Kiyomizu Temple. Over the last 360 years,we are proud to say that our spices have been enriching Japanese cuisine in this historical city of Kyoto. There are numerous spices around the globe. In Japan,the most popular ones are horseradish,mustard and pepper. They contribute to the rich food culture of Japan. There are many varieties of Shichimi Tougarasi across the country,and each province has developed its own recipe. We too have created “distinctive”flavor of our own. red chili ,black and white sesame,shiso,hempseed,green laver and Japanese green pepper. 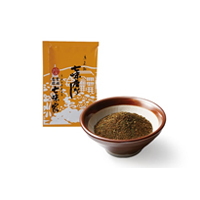 Our Shichimi Tougarashi a well-balanced mixture of flavor and spiciness, has been complimenting Kyo-ryori(Traditional Kyoto cooking) for centuries. 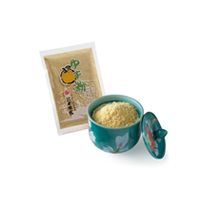 Its discreet spiciness emphasizes the elegant simplicity of Kyo-ryori. Traditional Kyoto cooks sprinkle Shichimi Tougarashi over almost anything ; Grilled chicken, miso soup, Tofu dishes, hotpot and pickles. Sprinkling our Shichimi to fried potetoes, pasta and many other modern dishes can make them very exotic! Our Sansho is also grown in our own farm and is handpicked to maintain the freshness of its aroma. 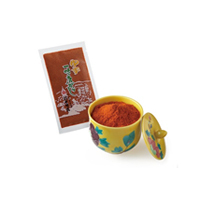 This pungent spiciness and the characteristic aroma is the key element of the flavor of our Shichimi Tougarashi. 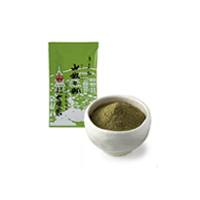 It is harvested only in the summer months, the seeds are removed before grinding, making this fresh green color. Traditional use of Sansho is sprinkled over the grilled eel, Yakitori(grilled chicken) and excellent with beefsteak too! Mixing with salt also makes a splendid seasoning for Tempura. It looses its flavor when heated(cooked), so it is best to sprinkle just before serving. Our Ichimi Tougarashi,this single variety of Japanese chili,has been cultivated in our own farm over many generations. Not only the spiciness,it has a good mellow taste with depth. It is versatile with all kind of Japanese food such as Udon,Soba(noodle soup),Tofu dishes and pickles. Only the very outer rind is used to maintain this brilliant color. Sprinkling over hot broth gives off a strong aroma. Mixing with salt,miso or adding to your usual dressing could create something unique! No coloring or preservatives are used in our spices. It is best to keep the spices in an airtight bag or container after opening the sachet. Home cooking of Kyoto is called “Obanzai”. ‘Dashi’ broth is the essence of traditional Japanese cooking and is what ｍakes the Japanese cuisine distinct from all other cuisines. 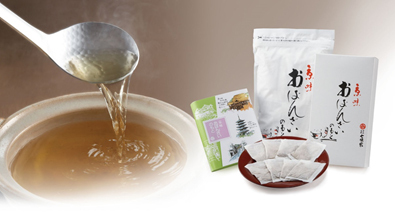 Kyoto Dashi is said to be the most refined taste of all. Our Dashi is made from dried fish and vegetables. We have managed to put this essence of ‘Dashi’ into convenient dashi bags so that the art of Japanese cooking can be created in your own kitchen every day! Put one dashi bag(8g)in boiled hot water and leave it for 3-5minutes. 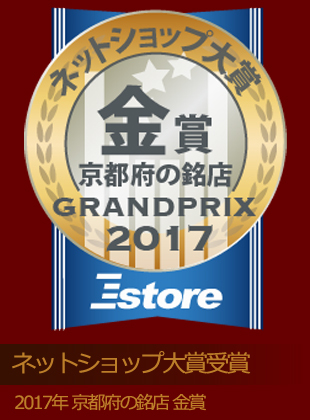 (C)Copyright SHICHIMIYA-HONPO CO,.LTD. All right reserved.